Well, this is timely. Today the New York Times reports that 20 percent of Americans (give or take) do not have enough money to buy adequate food. Timely because I’ve been thinking about need lately, in part thanks to the outpouring of generosity in response to the unfathomable devastation in Haiti. The epic scale of their need demands an epic response, no doubt. But the mundane need of an indigent Chicago mom with three kids and no peanut butter can be just as destructive, over time, to the quality of what social service professionals like to call “outcomes.” Unfortunately her need is so unremarkable as to often go … well … unremarked upon — Anderson Cooper being, g-d love him, busy elsewhere. So I wanted to take a minute to do a little remarking here on how one agency works quietly, boringly, to meet that need. Last weekend I went up to check out the Common Pantry, Chicago’s oldest continually-operating food pantry and the recipient of $244 of your generous soup donations on January 13. Board member Charlotte Robinson was at that soup night and offered to give me a tour of their outfit, so I took her up on it, cash in hand. As she warned, it didn’t take long! 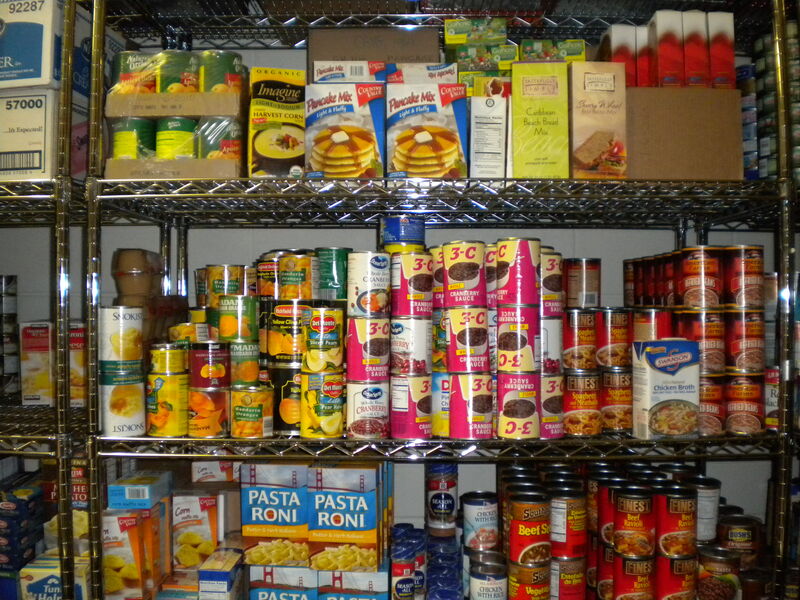 Tucked into rented space in the basement of Epiphany United Church of Christ at Damen and Bradley, the pantry takes up two tiny rooms crammed floor to ceiling with canned food, dry goods, and toiletries. Director Scott Best is the sole paid staff member, and he’s only there part time. The rest of the pantry’s business — packing up boxes, managing inventory, delivering meals to disabled and elderly clients — is handled by a passel of volunteers like Charlotte. 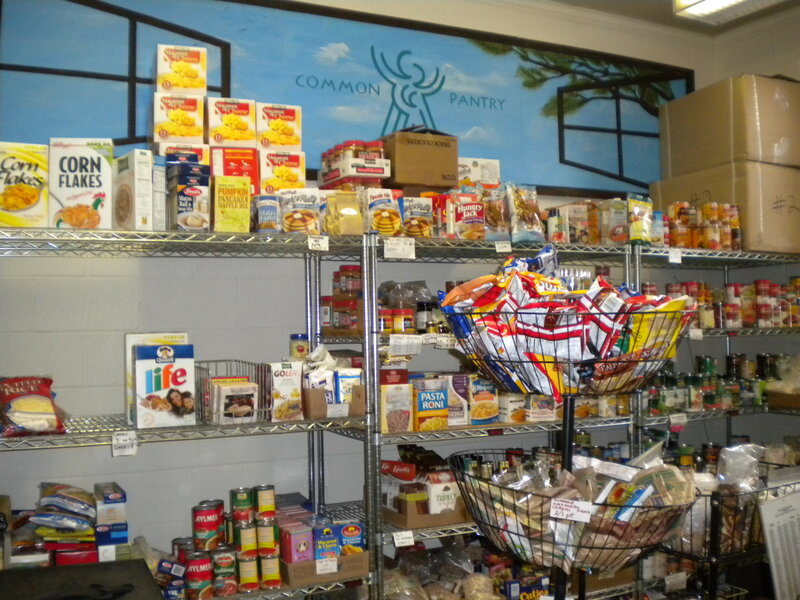 Most of Common Pantry’s food is bought at a discount through the Greater Chicago Food Depository or donated via food drives at places like nearby Lane Tech. That bounty (such as it is) is supplemented by government allocations secured through the USDA and TANF (“Temporary Assistance for Needy Families”), the basic government assistance program for families with dependent children. Based on what was was on the shelves, that looks to be mostly off-brand canned vegetables, rice, and beans. 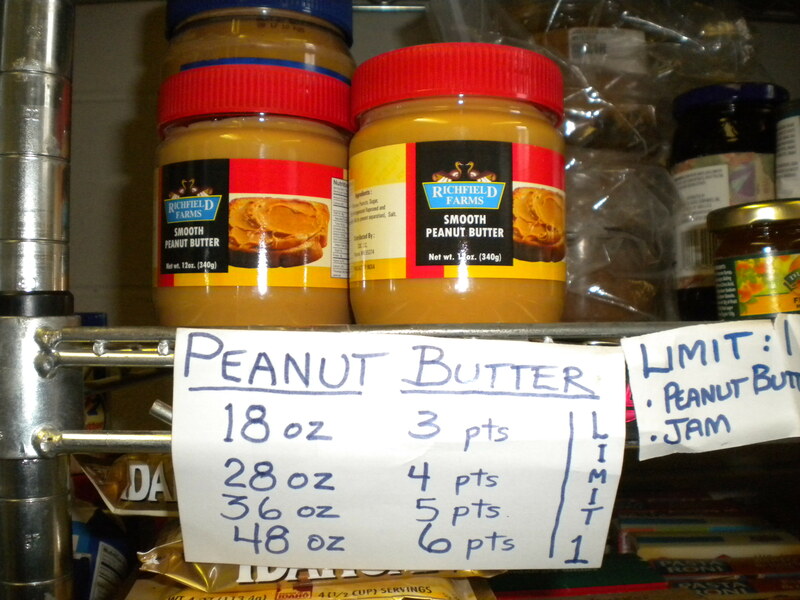 The pantry distributes food once a week, on Wednesdays, from 1 to 4 and 6 to 8 PM. Each client is eligible for one box of these basic groceries a month, but they can supplement the box with a range of variable goods that they shop for using a points system: each household gets a certain number of points based on how many family members there are, how many kids, how many infants, etc. This is all done on the honor system. There’s really no way for the volunteers to “verify” the relative neediness of the person applying for food, or the number of kids under 10 in the house, and, in fact, federal privacy laws prohibit it. If you’ve made it up to Damen and Grace on Wednesday afternoon, goes the logic, you’re in need. 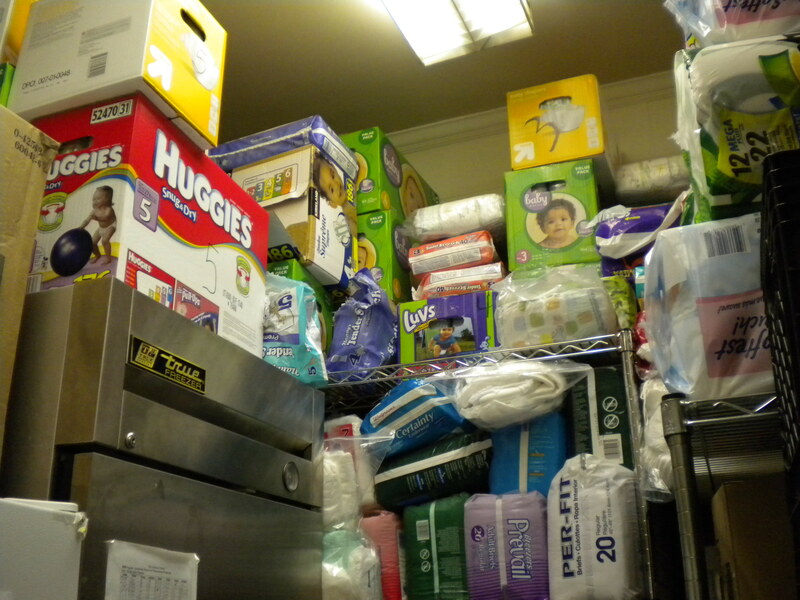 Hands-down, says Charlotte, the most popular items they stock are diapers — though, oddly, those do not appear on their wish list. I guess maybe they have a solid diaper hook-up? I forgot to ask. Other than that, they also try to keep in mind the material conditions of the people they serve. Many clients are housed, but others — those living on the streets, or at the Y — may not have a can opener, let alone a kitchen with, say, a refrigerator, or a stove. Thus, shelf-stable, single-serving foodstuffs: Pop-top cans of tuna. Pudding cups. Granola bars. And, ah, there’s the rub. Though Common Pantry does stock some fresh fruits and veggies, for the most part the shelves here, or at any food pantry, will make any self-respecting locavore run screaming in horror. And, just to preach for a second, reconciling the goals of the local, sustainable foods movement with the practical nutritional needs of the urban poor is THE CRITICAL CHALLENGE around which everyone working in this field should be mobilizing. But, erm, that’s another post. Common Pantry serves about 300 households a month and — again — while there’s no way to really determine how many people make up those 300 families, they estimate they’re helping get food to about 1,300 people living between Ravenswood, Kedzie, Lawrence, and Diversey, as well as all of the Lathrop Homes (even the part south of at Diversey) and residents of the Lakeview YMCA. In short, there’s a lot of good work happening here, and other church basements and repurposed storage closets across the city. If you’re interested in pitching in, Common Pantry needs volunteers, mostly on Mondays, Wednesdays, and Saturdays — or see their list of 10 Ways to Help. ETA: I forgot to mention that the church itself is also working to meet the needs of the hungry with a weekly hot meal courtesy of First Slice — itself a terrific organization about which you will be hearing more soon. Our proceeds benefit First Slice on February 24, and they’ll be providing a soup that night as well. The following week we (er, Soup and Bread, Inc.) are participating in the annual Lillstreet Art Center Empty Bowls event, which also benefits First Slice. I have long been a fan of First Slice’s philosophy, which prioritizes the needs of the hungry by offering them the symbolic “first slice” of the pie, rather than the leftovers. Or, in their case, hot, fresh, creatively prepared food rather than rice and beans. Or soup. 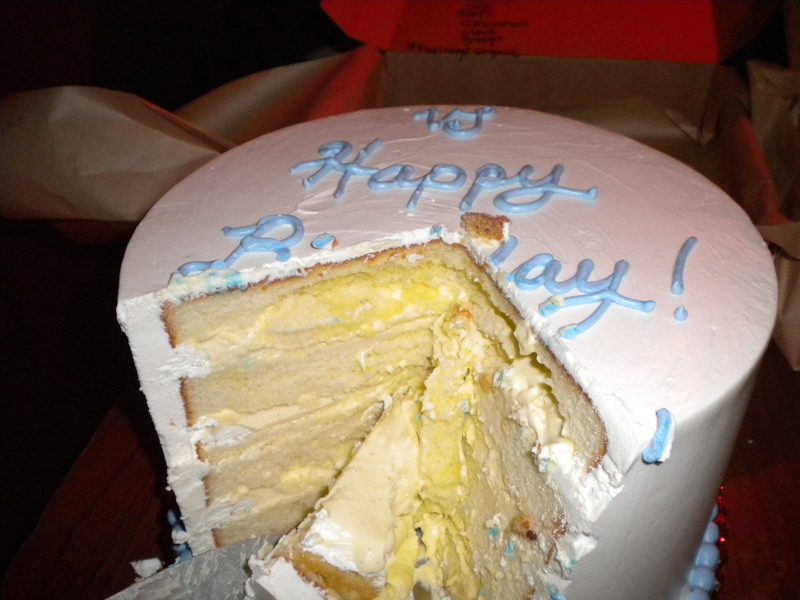 And, just to bring this long post around full circle, this ‘first slice” principle has a lot in common with Dr. Paul Farmer’s “preferential option for the poor,” a critical tenet of liberation theology and the mission driving Partners In Health, which has been doing just that — providing quality, comprehensive health care to the desperately poor in Haiti and elsewhere — for 20 years now. 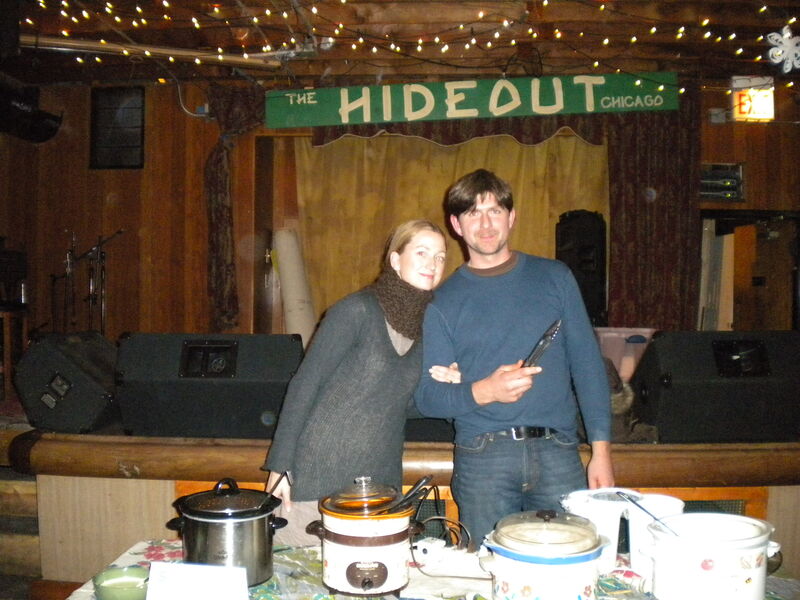 We (the Hideout) raised about $8,000 for PIH last week, but they need a hell of a lot more. Our second soup night was as fun as the first — and I got to even hang out in the back room and serve my soup, for a change, after Andrea stepped in to bartend. It’s so cozy back there! I had no idea. Our soup deliveries were unintentionally staggered this time around. First up, in the early part of the evening, Anastasia (left), with a terrific spicy pumpkin soup served with a cilantro cream. To her right, wielding some mean tongs, is Brian Ferguson, executive chef at the Empty Bottle’s Bite Cafe and Big Bite Catering. He turned up with a deeply satisfying chicken-hominy soup that was served with crispy fried tortilla strips and dashes of fresh-squeezed lime. Both of these soups were big hits with the early birds and, to those who arrived too late to get a taste, I can only console you with the information that both Brian and Anastasia have already whipped off their recipes (so prompt!) and I should be posting them soon. Next up was actually me — with a ham, bean, and tortellini soup cooked up over two days from a recipe provided by Duncan Bayne, who’s another generous Kickstarter donor. And my father. But we’ll get to that soup in another post. Just as my crock was starting to look a little bare, reinforcements showed up in the form of Rebecca Tung, Marianne Eberhardt, and Phyllis Dickstein. 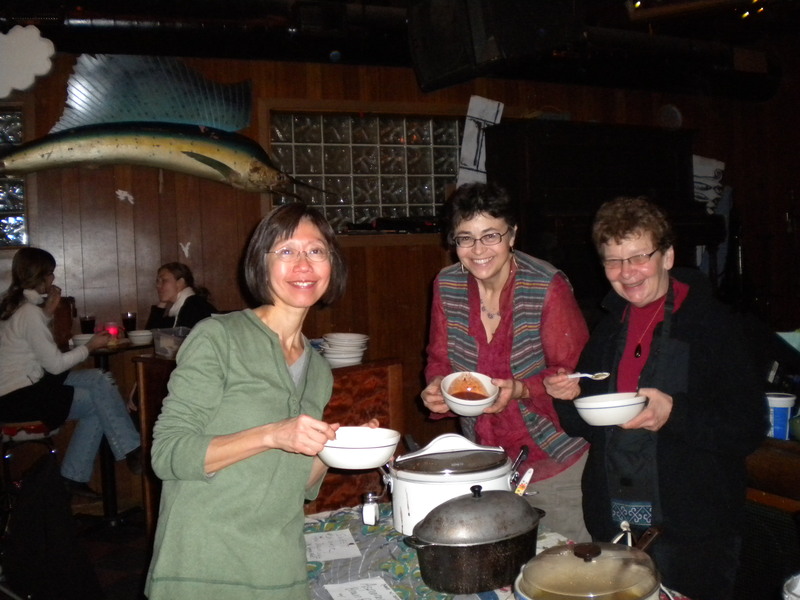 These three are Soup and Bread newbies who signed up to cook at the book release party; they delivered a trifecta of soup goods: hearty vegetable-beef (Phyllis), a thick and flavorful asparagus with brown rice (Marianne), and for dessert — whoa — a sweet Chinese red bean (Rebecca; think red bean ice cream, but hot and liquid). Rae started a new semester of culinary school this week, and supplied us with a amazing array of bounty, some of it homework, some of it just for fun. 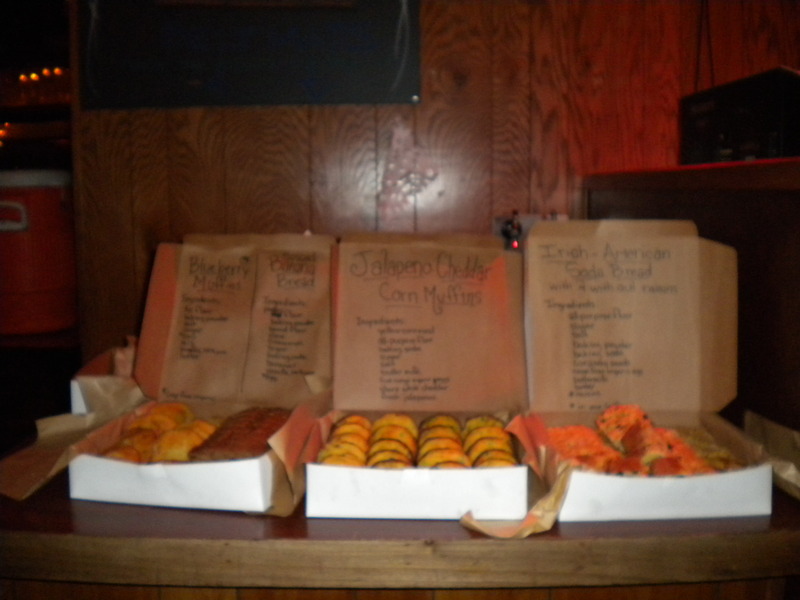 From left to right, there, we’ve got blueberry muffins, banana bread, jalapeno-cheddar-corn muffins, and Irish soda bread, both with raisins and without. Not shown, but very much eaten: molasses cookies and … some other little sugar cookie thing with jam filling. 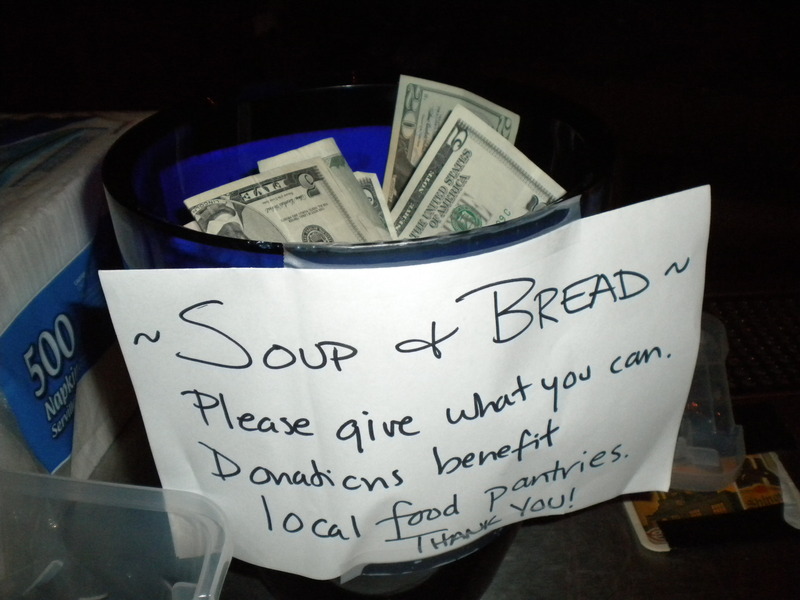 Charlotte Robinson, the Common Pantry board member who suggested her organization as a possible recipient of Soup and Bread’s weekly wad of only-slightly grubby bills, was in the house as well. I’m going to hook up with her later this weekend to deliver the $240 we raised, and take a little tour of their outfit. Hopefully I’ll have something more to say on that front soon. In the meantime, I’m off to the unemployment office (fun!). Stay tuned for more recipes and the scoop on who’s cooking next week.